Dimensions 1.50 by 6.25 by 9 in. The International History of Communication Study maps the growth of media and communication studies around the world. Drawing out transnational flows of ideas, institutions, publications, and people, it offers the most comprehensive picture to date of the global history of communication research and education. This volume reaches into national and regional areas that have not received much attention in the scholarship until now, including Asia, Latin America, Africa, and the Middle East alongside Europe and North America. It also covers communication study outside of academic settings: in international organizations like UNESCO, and among commercial and civic groups. It moves beyond the traditional canon to cover work by forgotten figures, including women scholars in the field and those outside of the United States and Europe, and it situates them all within the broader geopolitical, institutional, and intellectual landscapes that have shaped communication study globally. Intended for scholars and graduate students in communication, media studies, and journalism, this volume pushes the history of communication study in new directions by taking an aggressively international and comparative perspective on the historiography of the field. Methodologically and conceptually, the volume breaks new ground in bringing comparative, transnational, and global frames to bear, and puts under the spotlight what has heretofore only lingered in the penumbra of the history of communication study. 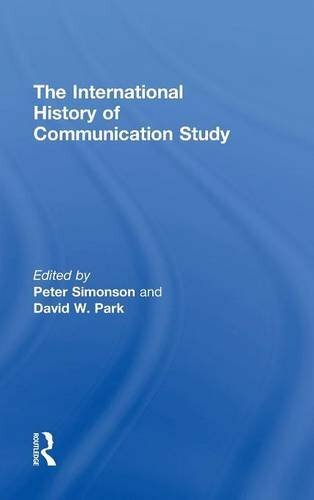 With Peter Simonson (other contributor) | from Routledge (November 2, 2015); titled "The International History of Communication Study"
About: The International History of Communication Study maps the growth of media and communication studies around the world. With Peter Simonson (other contributor) | from Routledge (October 23, 2015); titled "The International History of Communication Study"